The UK imports vast quantities of soybean for poultry feed. But now there’s a push to grow it closer to home. Soybean is the largest source of animal protein in the world – and it is easy to see why. The crop not only has a great nutrient profile with high protein content (more than 40%) and balanced amino acid composition, it’s also available year round in predictable quantities – a prerequisite for poultry farmers rearing livestock 365 days a year. “It’s pretty indispensable,” says James McCulloch, head of sector animal feed at the Agricultural Industries Confederation (AIC). The UK, for example, imports around 3.3 million tonnes annually, almost 60% of which is used by the poultry industry. Most of it comes from Brazil, Argentina, Paraguay and the US. 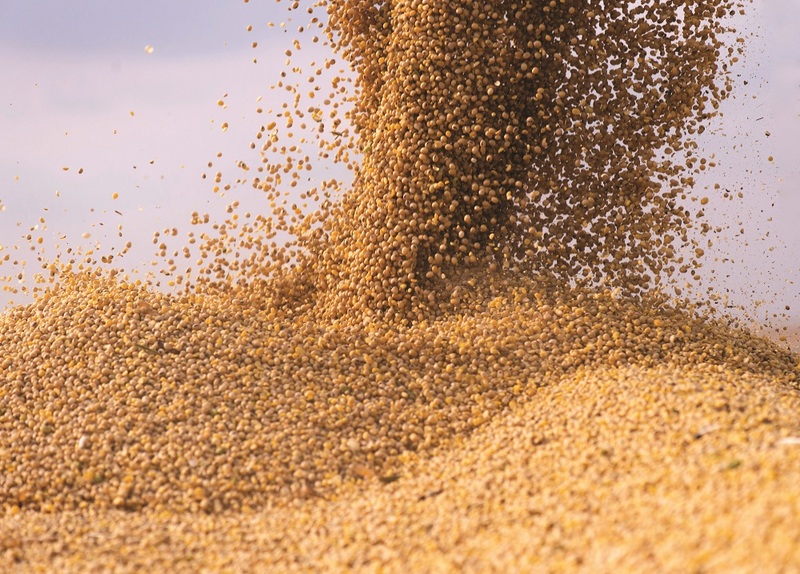 It’s a similar story right across the EU – in the 27 weeks to January 9, 2019, the bloc imported 6,952,645 tonnes of soybean – up 11.8% on the same period the previous year. Of that, well over 90% will be used in animal feed, with poultry (35%) and pigs (33%) taking the lion’s share. But is this huge protein trade imbalance cause for concern and, if so, can production be brought closer to home? And if not, what are the alternatives? “…to base that production so heavily in the feeding of imported soya is unsustainable and an economic risk”, noted the Processors and Growers Research Association recently. They have a point – between the three major suppliers, Brazil, Argentina and the US, you’d be hard-pressed to choose the least politically stable at the moment. Indeed, Donald Trump’s trade and tariff war with China has “reshaped the global market for soybeans”, according to analysis by Eurativ.com, diverting produce from Brazil – originally intended for Europe – towards China, and slashing the price of US exports. This time last year, US share of soybeans imports to the EU was 39%; now it is almost 75%. China, of course, is the major player on the global commodity market for soy – and that potentially threatens supply everywhere else. Global production of soybean is around 370 million tonnes, about half of which is retained by producing countries for their own use, leaving 185 million tonnes “available”. Of that, China took a 105 million tonne chunk last year as its growing middle classes consumed more and more meat. “They’ll take another five million tonnes next year, and another the year after and so on,” says David McNaughton, director at Soya-UK, which supplies seeds and advice to UK farmer. Indeed, peak demand for soy is some way off: the Food and Agriculture Organisation of the United Nations (FAO) suggests soy production could hit 515 million tonnes by 2050. But even if there is enough to go around, where will it be grown? Soy, like palm oil, is now inextricably linked with deforestation and that means there is mounting pressure on the food industry to source responsibly or find alternatives. Sustainable soy is available but not very popular. That could soon change thanks to an initiative launched in the UK. In March last year, the government convened the first meeting of the UK Roundtable on Sustainable Soy (RTSS). Members include 2 Sisters Food Group, Cranswick, Moy Park, Nando’s, Tulip and the major supermarkets (bar Morrisons); each has committed to publish “timebound plans” by April this year that will ensure the only soy in their supply chains is “legal and cultivated in a way that protects against conversion of forests and valuable native vegetation”. Tesco has already gone public with a target to source only from verified zero deforestation areas by 2025, whilst Asda has promised to source 100% physically certified responsible soy by 2025. “Retailers hold the power – they can set the standards and sourcing policies that can ripple down the supply chain,” says Samuel Smith, senior strategist at Forum for the Future, which runs the Feed Compass industry initiative, aimed at identifying novel feed sources and scaling them up. Waitrose is one of the companies involved, and has helped develop a set of nine principles for assessing “sustainable” animal feed. Defining what sustainable soy looks like can be problematic, but there are certification schemes available – the most widely used is led by the Roundtable on Responsible Soy (RTRS, and not to be confused with the UK RTSS which isn’t a certification scheme). RTRS-certified tonnages represent just 1-2% of the market and there are those that wonder if there is any wriggle room in current supply chains to pay the premium it commands – even though this is less than 1%. That’s about $2 or $3 a tonne, according to Christophe Callu Mérite, protein purchaser at Feed Alliance and RTRS executive board member, which is “huge” when the bill lands at the door of the feed industry – what he calls the “weakest link”, given that it is working with large volumes and an average return of 1%. “It’s always the case – you have the big brands and retail who want to be sustainable but when the costs come, well…” he told FeedNavigator.com recently. McCulloch at AIC also offers a word of caution: “We can respond to the retailers [but]we need to avoid any requirement that would make the UK feed industry and therefore UK farmers less competitive by coming out with [something]that isn’t deliverable.” This is perhaps a nod towards past policies that required only non-GM feed in retail supply chains. These were well-publicised around five years ago, but the commitments have been quietly mothballed as supermarkets quickly realised how difficult sourcing GM-free soy was going to be. Only Waitrose appears to have bucked that trend, announcing in 2016 that it would be the first to introduce responsibly sourced non-GM soy animal feed from Europe (for its pigs). Sourcing more soya from Europe – where it is GM-free, fully traceable and not from deforested land – is an attractive proposition. It could soon become a more viable one. In November, the European Commission published a “plant protein plan” – a review of supply and demand for a range of protein-rich crops, including oilseeds (rapeseed, sunflower seeds and soybeans) and pulses (beans, peas, lupins and lentils). The report highlighted just how exposed the EU is – soy self-sufficiency is just 5% – so the plan is to grow more plant-based proteins here. Europe is off to a decent start: the area used to grow soy, for example, has already doubled to almost one million hectares since the Common Agricultural Policy (CAP) reform in 2013, with production up to 2.8 million tonnes. Agriculture Commissioner Phil Hogan now wants to incentivise more production through CAP, as well as deliver more research and innovation programmes like the one underway in Germany, where more than 225 farms are testing varieties of soy, peas and beans and lupins. Germany is one of a number of countries where soy production has mushroomed – from nothing to 100,000 acres in give years. “It’s been astonishing,” says McNaughton. The UK is behind that curve, with 8,000 acres of soy planted last year. There will hopefully be another “significant jump” this year, but the high price for wheat could well turn farmers’ heads, McNaughton says. “We managed 6,000 tonnes of soy last year, which isn’t a bad start [given the drought].” He forecasts continuing expansion in the south where producers need break crops like soy “big time”, though production can go as far north as Doncaster. The margins can stack up quite well, with hard IP (identify preserved) soy fetching around £400 per tonne, compared to £340 for the any origin market. Of course, 6,000 tonnes represents just 0.2% of the 3.3 million tonnes the UK currently needs. This means the search for alternatives will intensify. Everything from pulses and insects to algae and amino acid additives are being considered. All these offer potential, but will need support from the government. “There’s a huge commercial opportunity to develop more home grown markets for poultry feed and reduce environmental impacts,” says Mark Driscoll, founder of the consultancy, Tasting the Future. “The UK Agriculture Bill [presents]a real opportunity to promote alternative feed crops and ensure any subsidy system incentivises the use of alternatives.” Brexit – as ever – presents an opportunity, it seems, yet feed has been conspicuous only by its absence in policy documents so far. Peas and beans. Cheaper, but much lower protein content is a problem. “In the ration there is very little space for anything else, so lower protein content means more material,” says McCulloch. Lupins. Protein value is comparable to soy, but they are not easy to grow in the UK. “You’ll find people who regret growing lupins, but you won’t find anyone who regrets feeding the,” says McNaughton. Insects. Trials show potential and the EU could soon approve the use of insect protein for poultry feed (live insects and insect oil are permitted but not insect meal). There are ethical and sustainability considerations too, including what to feed the bugs on. Algae. Showing promise, given that they are sustainable, high in protein (up to 70%) and can boost quality in eggs. They could even reduce reliance on antibiotics. Currently expensive.